Much to the surprise of many, Henrik is not granted Norwegian citizenship just because he was born in Norway. Norway does not have Jus soli (italics used to highlight Latin and not Norwegian this time, and meaning right of birthplace) unlike the United States. He is, however, an American citizen, due to Jus Sanguinis (right of blood), since Erik and I are American citizens. But, since he wasn't born in the United States, the actual documentation of his American citizenship was not a straightforward case. 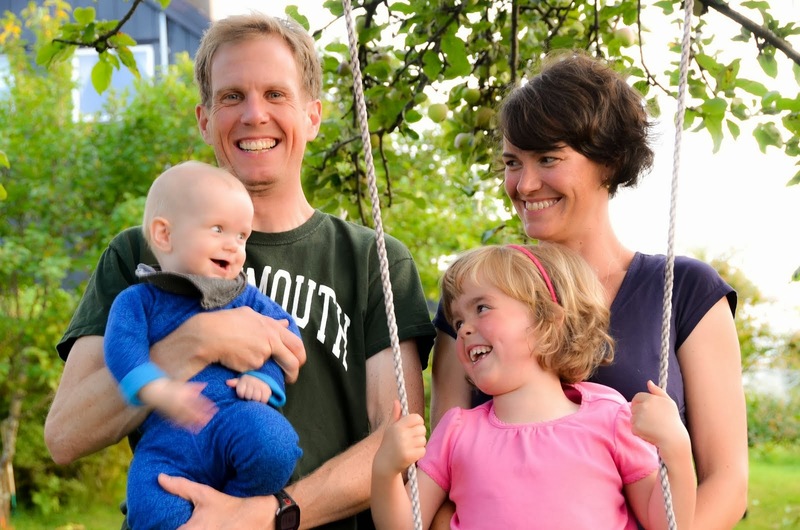 We had to apply for a "consular report of birth abroad" through the American Embassy in Oslo, along with an application for his American passport (necessarily to travel with, even for an infant), and his American social security number. This required that Erik and I make a trip together--along with Henrik, and of course, Greta--to the Embassy in Oslo to apply for these in person, along with a stack of supporting documentation proving Erik and I are who we say we are: our own birth certificates, original marriage certificate, 5+ years of school records (proving we actually lived in the United States), Henrik's Norwegian birth certificate, our own passports (along with Greta's passport, simply so she could enter the Embassy along with us), and the three separate applications for the birth abroad certificate, social security and passport. And then pay about $200. But for all of this to happen we first had to have Henrik's Norwegian birth certificate in our hands. We applied for this online a few weeks after he was born. On the website, we had to fill in his first, middle and last name. These names must be on a list of approved names, and if it's not, you must apply for the name and explain your reasons for choosing this name. My Norwegian friend Karianne said that her name--40 years ago--was not on the list! This is something that perhaps the United States should consider, in order to stop people from naming their kids Lemonjello, Se7en, and Neveah Legna (Heaven Angel backwards). Don't get me started on stupid people picking stupid baby names. Oh wait, you already did. . . So, interestingly enough, Henrik's middle name "David" was rejected as a "middle" name. In Norway, many people have two first names: Tor Kristian, Jon Gunnar, Mette Marit, Ann Kristin, and they use both names in everyday life. But what we consider to be the space for a "middle" name in the United States, is reserved for a last name--like the mother's maiden name--if the parents aren't doing the hyphenated last name thing. So, you could have, for example Tor Kristian Sandvik Hammarshaug. Or, Tor Kristian Sandvik Hammarshaug-Lien if the parents are hyphenating their names. Confusing, perhaps. But as a result, when we got Henrik's Norwegian birth certificate, it read that his first name is Henrik David with no middle name. The birth certificate itself, however. . . . I'm sorry Norway, but it really made me laugh. It is perhaps the most unimpressive, unofficial-looking official document I have ever seen. It looked as if it was printed on regular printer paper, black and white, no raised ink seal, no watermark, no fancy flowery edging, just a single blue ink stamp at the bottom. 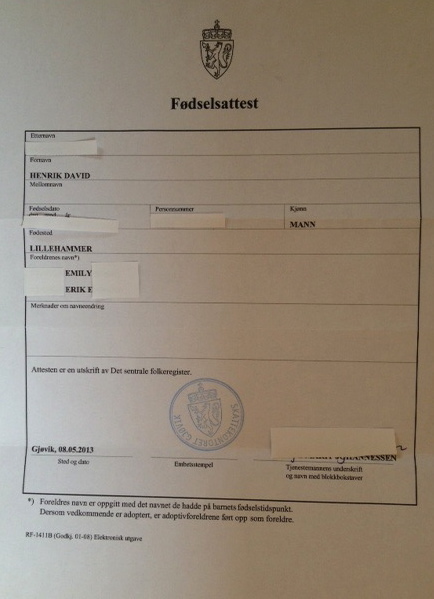 I emailed an American friend of mine who has given birth to two babies in Norway, expressing my amusement over this underwhelming official document, and she responded that she had printed more official looking birth certificates from the internet for her cat's kittens than what Norway gives their kids. Thankfully, the US pulled through when it came to providing us with an official looking document. Henrik's Consular Report of Birth Abroad certificate arrived in the mail last week, and a more over the top document it could not be. The contrast between the two certificates only make the situation more absurd: fancy watermarked paper with italics and impressive fonts, shiny raised gold seals, a shimmery 3D stripe of colorful stars (not kidding), eagles and tendrils and even the Declaration of Independence. God Bless America. Our boy is officially American. I have to laugh at the Norwegian certificate. My English MsS diploma looks very similar to Henrick's birth certificate, like someone printed it on their home computer or something. I always loved the poetic way the two first names sound. What I like and appreciate about the two first names is that Norwegians make the effort to use the full names. In the States everyone's name gets shortened to a nickname, and we went to great lengths to choose a name for Greta that could not be shortened. I loved the name Elizabeth, but didn't want her to be Liz, or Beth, or Betsy or Lizzy. Erik had a ski coach named Torbjorn, and in the States everyone called him Tor. I'm realizing now that he was probably always called Torbjorn (which is actually just ONE name and not two) in Norway and never shortened to Tor until he moved to the US. Ha! I love the differences between the documents. USA! USA! 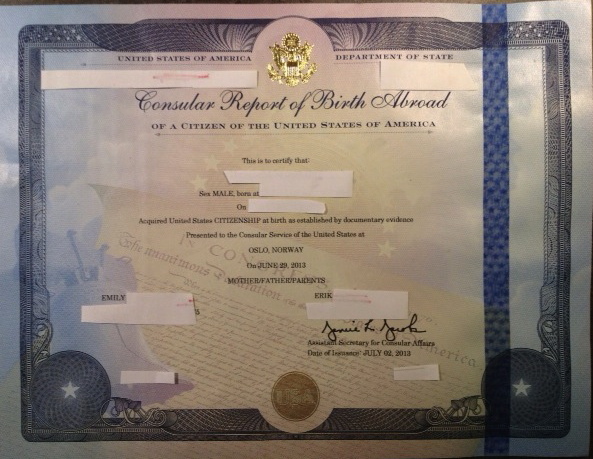 My husband (a Norwegian) was very excited by our son's birth certificate here in the US because it looks so "fancy!" Our marriage certificate (from Norway) is on a plain white piece of paper that looks like the judge's assistant typed it up in Word, printed it out, and stamped it with a blue stamp. Underwhelming. Congrats on getting all your documents! I'm actually very relieved that we have an additional document for his birth, because I'm not sure that people (in the US) would believe that it was a legitimate document! maybe you could help me. If asking for the birthday report and passport we didn't ask to make him social security number, then I should go to the embassy again? We plan my son, who got the american passport, to stay summer in U.S.so he'd definitely need social number for the day camp etc. I have no idea, Simona. I recommend you contact the US Embassy with your questions. Do you want to fram it and put it on a wall? What is the purpose of this fancy birth certificate?